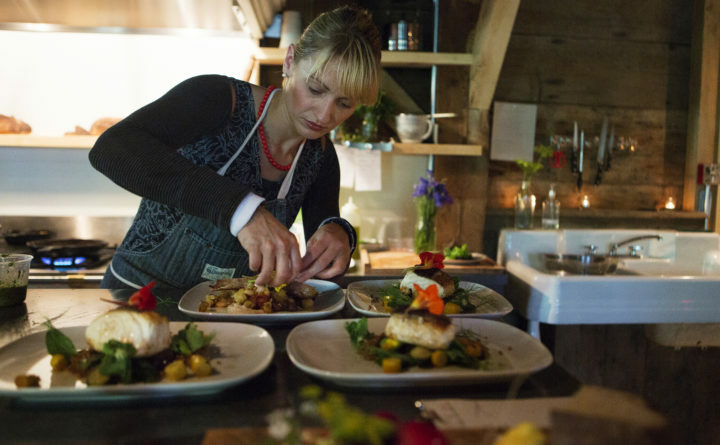 The Lost Kitchen chef and owner Erin French prepares meals during dinner. The restaurant is moving toward an old fashioned reservation system following last year's flood of phone calls. Last year, if you were one of the people around the country and beyond who waited for the clock to strike midnight on April 1 in order to call a tiny restaurant in rural Maine to make a reservation for the upcoming season, you were in good company. Make that overwhelming company. Altogether, the 40-seat Lost Kitchen in Freedom received 10,000 calls in 24 hours from would-be diners vying for a reservation for 2017. The restaurant’s acclaimed chef-owner Erin French had expected a few dozen calls overnight, but the calls came in so fast and furiously they swamped her three phone lines and caused alarms to go off when the emergency lines to the Waldo County town’s fire department were blocked, according to a report published last year by the Associated Press. This year, French is taking steps to avoid a repeat of what happened then. Instead of taking reservations by telephone, she will be accepting reservation requests by mail only. They must be written on 3 x 5-inch notecards postmarked between March 31 and April 10, 2018. Towards that goal, she said that those who are interested in making reservations for the 2018 season, which runs from the beginning of May to New Year’s Eve, should write their name, mailing address, email address and phone number on one side of the notecard. On the other side, they can leave a personal note if they wish, although that is not a requirement and will not affect the random selection of their card, French said. The card should then be placed in an envelope and mailed to The Lost Kitchen, 22 Mill Street, Freedom, ME 04941. Cards will be accepted between April 1 and April 10th.